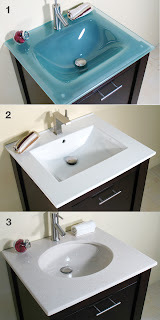 Bathroom Vanities blog: CHOOSING THE VANITY TOP THAT IS RIGHT FOR YOU! CHOOSING THE VANITY TOP THAT IS RIGHT FOR YOU! At Bathroom Place we understand that people have different taste and needs and a single choice will not satisfy everyone. That is why we want to give you the power of choice when it comes to selecting a countertop for your favorite bathroom vanity. To help you decide which of these options is right for you, we have put together a summary of the pros and cons for each countertop material. Pros: In either clear or frosted finish tempered glass offers a unique, sleek and modern look that will set your bathroom apart. It is one of the easiest surfaces to clean and has very good tolerance to heat, it won't burn or melt if you ever forget to turn off that curling iron! Tempered glass is also a non-porous surface which means bacteria and germs have no place to grow making it very hygienic and stain resistant. Cons: Even though tempered glass has been heat treated to increase its strength, it can scratch or chip depending on how is handled. Also, if not cleaned properly it can show finger prints and water spots (especially clear glass). Pros: Porcelain offers a contemporary look and matches beautifully with other fixtures in the bathroom. It has an extra smooth surface that prevents debris from sticking. It requires very little upkeep to make it look clean and shiny all the time. It is also very strong, doesn't chip easily, and wont melt if exposed to high temperatures. Cons: It can crack or chip depending on the abuse. Pros: Made from the mix of natural marble chips and acrylic resin, cultured marble offers the classic and shiny look of natural marble and granite without the expensive price tag. This strong surface is very durable, stain resistant and requires minimum maintenance. Cons: Heavy falling objects and extreme heat (not too much of a threat in bathrooms) can cause this surface to chip, scratch or melt. *Options available for VIENNA and MONACO collections. Are Oversized Walk-In Showers the New Black? GREAT BATHROOMS START AT BATHROOM PLACE! Copyright © 2011 Bathroom Place. Powered by Blogger. connect with us Share your remodeling story and find inspiration. Copyright © 2015 Bathroom Place. All rights reserved.